I monitor the government bond yields of three countries (Australia, United Kingdom and the United States) and they are all rising. 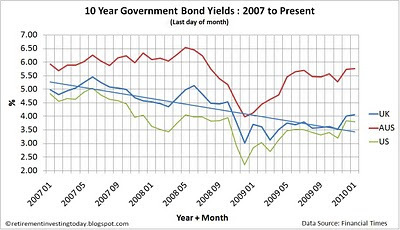 My chart today shows the month end (except the last point which is the 08 January 2010) 10 year bond yields since 2007. Why are they rising? Comparing Australia and the UK I think for different reasons. As an outsider I think Australian bond yields are rising because the country is being run relatively prudently by the Reserve Bank of Australia and is raising interest rates as they are serious about keeping inflation at 2-3% over the cycle. The cash rate set by the RBA is now 3.75%. Savings account interest rates are also rising and without too much difficulty it is easy to find an instant access bank account paying 4.25%. So it makes sense for Bond yields to be rising to the 5.76% today. Reason 1. I have shown previously that inflation is rising and it appears to me as though the Bank of England is going to hold interest rates at 0.5%, ignore their inflation target of 2% and start to let debts be inflated away which I discussed here. This seems to be reinforced by the Pension Fund of the Bank of England who have 88.2% of assets devoted to Index-linked gilts and other government guaranteed index-linked securities and 10.9% to fixed-interest gilts and other government guaranteed fixed-interest securities. This is up from 70.7% and 22.3% respectively in 2008. Buyers of government debt will however expect a real (after inflation) return on their investment and so if inflation rises then gilt yields must also rise. Reason 2. The 2009 pre-budget report stated that UK government borrowing would be 12% of gross domestic product (GDP) in 2010/2011 and still a crazy 9.1% in 2011/2012. The Office for National Statistics reported on the 22 December that Q3 2009 GDP was £315.5 billion. Extrapolating this indicates that borrowing in 2010/2011 will be £150 billion and in 2011/2012 will still be £110 billion. To find buyers for all this debt (particularly if the Bank of England stops quantitative easing) you are going to have to attract them with increased yields. Reason 3. The UK government are yet (and for that matter the Conservatives also) to explain how they are going to reduce the levels of borrowing. So far they have done nothing more than rearrange the deck chairs on the Titanic. If this continues the credit worthiness of the UK is going to be downgraded meaning yields will have to rise. Reason 4. Those who already own government bonds and can see what’s happening will start to sell their holdings putting yet more gilts onto the market. This issue is real with the world’s biggest bond investor , Pimco, has started to sell off its holdings of gilts. More gilts coming to the market will mean gilt prices falling which will then mean rising gilt yields. So what does this mean for my retirement investing strategy? Firstly, if I owned gilts I’d be considering selling. As I’ve described previously I don’t own fixed interest gilts so I’m ok here. I do own index linked gilts but with inflation kicking off I’m comfortable with this. Secondly, I’ll be watching house prices carefully. The interest rates on mortgages will have to rise as those wanting to borrow for a house will effectively be competing with the UK government for funds. I can’t see how house prices can continue to rise with increased borrowing costs and this could turn out to be the catalyst that brings on a reduction in house prices. I'm looking for 10 year gilts at above 5% before I even dip my toe in. And to be honest I think that could seem hilariously low before we're done.